Little Bit Funky: want some free mojo? I don't know about you, but there is just something about holding an ACTUAL magazine in your hands that evokes a certain kind of inspiration. Not that I have lots of time to sit down with a magazine...but when I do...it always, always, always reminds me of my single, kid-less days...when my best friend and I would go to Barnes and Noble with our knitting and sit for hours, knitting, drinking coffee and reading magazines. Those were the BEST days. And while for now, those days are sitting on the back burner, I have hopes of them returning one day. I'm thinking I want to make new matching stockings this year...maybe this would be a start? These look like fun...maybe get the boys to draw itty bitty pictures to go in the center and use them as gifts for family or teachers? I just love the aqua flower to the right...making those for sure. But these are my favorite...I plan to make a couple to add to a scarf I am knitting. Beautimous. Here's another photo...lots of texture and pretty fabric...I am loving the batting peeking through. And don't forget to enter the Less Ordinary Designs giveaway over HERE. I would love to have a copy of this magazine! I'm just learning to sew and this would give me some great ideas! Can't wait to see your scarf! 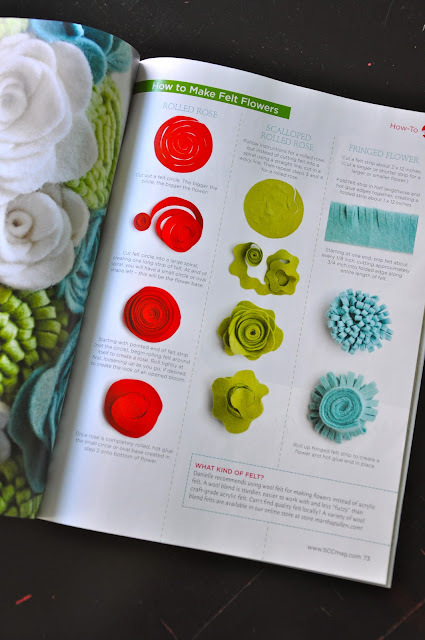 I am trying to put together a craft time for the moms on my son's hockey team and would love to win this magazine so I can do those felt flowers! They look inexpensive and simple enough that even the least creative mom could do it! LOL. Pick me, pick me! I love your blog and I am delurking! That looks like a great magazine. I also saw some things I would make for myself and gifts. Would love to win a copy!! Looks pretty inspiring! Thanks for the offer! I like your Eph 4:29 quote on your comments section, so fitting! Oh no, I wish I wasn't the first entry. I'll cross my fingers and hope to win anyway! I have never gotten that magazine...but I can tell I already love it! Fingers crossed I win:) I use to read lots of magazines but now I read mostly blogs. Thanks for offering up this great giveaway! can't wait to see what you make next...you are so talented! That magazine looks great! I'd love to win a copy for some holiday inspiration. I would love a copy of this magazine!! It looks awesome and I would love to sit in a quite corner of my bedroom all by myself and read it!! Thanks for the chance to win! I came here from Pinterest for the mini apple pies....and look what I found!!! :) I would love love love to win this magazine!!! Who doesn't love a magazine. Love the blog. Check it weekly for good ideas! Thanks for all the time you put into it!! Craft magazines are the best, especially with BIG pictures! I love craft magazines, especially those with BIG pictures! I do love a good magazine, especially one filled with crafty and/or baking goodness! Looks like this one has lots of great ideas in it! That magazine looks great, and I'm totally with you on never feeling like there's enough time to really look through them. I'd be sure to make time if I won this one though! Looks like a fun magazine - if I don't win I will be looking for it on the mag shelves. I bought can biscuits last night and hope to make some donuts one night this week. I remember having homemade donuts for dessert in the fall as a kid. I loved watching them rise to the top of the oil and sometimes they would flip themselves. Just thought I don't think I would have been allowing my kids to be that close to a pan of hot oil - different times I guess, we didn't have seat belts either. Ahh, knitting and coffee and Barns and Noble, that sounds lovely. But like you, my days are filled with entertaining small boys which is lovely in its own way. That magazine looks like a lot of fun. I am sure I could get some ideas. Does it come with a radioactive spider to help me accomplish some of the crafts. I'm the kind of girl who thinks an actual magazine is better than chocolate! It is a special treat to be devoured from cover to cover :) Thanks for sharing the opportunity! this magazine would be a treasure! hope you had a wonderful tuesday! Those flowers are wonderful!!! Can't wait to see how your scarf turns out...I made some fabric scarves last year (with minky backing) that would look great with one of those flowers on it!! I would love to win this magazine to help me with my Christmas crafts this year!! Awesome! I would love a little inspiration! Thanks a lot! that looks like it has some great projects in it! Love inspiring magazines and your blog! Love that fabric flower! Maybe when the boys are older, you can resume your knitting and coffee nights at B&N! I too am in need of inspiration. i would love to win a copy of this magazine... i just stumbled upon your blog and will now be a faithful visitor! thanks! Oh, I love "real" magazines! Thanks for the giveaway! I'm so curious about that flower you want to make for your scarf. It's so cute and I can't wait to see your take on it. I'd love to win a copy for myself. YOU totally inspire me with all your creative energy!!! I love to dabble in so many different crafts. looks like that would be a lovely magazine to get a copy of! My fingers are itching with the need to create something. I bet I could pick a fun project from the magazine! I would love to win this magazine since I can't seem to find it in any stores around my area. But since I live it Maine it seems we are are always the last to get things. I love reading your blog and love your crafts. I like that your a 'real' person and tell it like it is. You make me wish I could stay home rather than coming into work everyday. eeeep! How cute would matching homemade stockings be for my lil elves this Christmas? LOVE! would love to get a copy of this magazine. thanks for the giveaway! I could totally use some mojo right now. I'm in a funk and I'm not feeling the Christmas spirit because it's our first year in Australia and this hot summer weather is the opposite of Christmas for me. Relaxing with coffee & a magazine sounds delightful! Wonder when I can fit that in? I like your blog. I am making the donuts as I type!! I would love to get my hands on the magazine too!!! How fun! I love hearing about new creative magazines. I get so much inspiration from them!!! Love the inspiration in this magazine! ADORABLE :) I would love to win a copy. I would love the free copy! I want to make the rolled roses to embellish a headband. I love crafting especially ones I can share with my scouts. Ok now dont be a magazine piggy. Share one with me please. :) Id lvoe some fresh ideas for handmade Christmas gifts this year! Love all the bright Christmas colors! Pre-kiddos, my husband and I ended almost every Friday night dinner out with a trip to B & N for coffee, conversation and magazine browsing :) Thanks to the train table in the kids section, we are still able to go occasionally with our son in tow. I said - ooohhh when I saw that cover. Looks like just the thing to curl up on the couch with a hot chocolate. I totally love all the inspiration you give us;) THanks!! I'd love this mag! Before I read your post I had a scheduled "Friend date" with my best friend but we didn't know exactly what we were going to do. When I saw your post it gave me the idea to go to Barnes & Noble to read magazines and drink tea/coffee. Much needed stress reliever! I even was able to find that magazine and look through it, fantastic! I adore your blog and the heart you have for the Lord and for your family. You inspire me! I have been married for three years now and I can finally make our own stockings, and anything crafty would be awesome to know. We are on a budget, and I just love handmade things! What a lovely blog! I am so glad I stumbled upon it (via Our Fifth House)! I would love to win the magazine - it looks like it is filled with lots of great ideas! I'm going to become a follower - please visit me at Home in Douglas! Wow! This mag looks amazing. And I DO love you and your amazing blog. I really truly do. wow what a lovely giveaway. I love your honesty and realness. I just found out my best friend is pregnant and I want to print out the letter you write in the post above and give it to her - would be so helpful! I would love to win a copy of the magazine. Looks like it would be right up my alley. Thanks! Oh, this looks like a lovely magazine! I am on the hunt for it now. Thanks! this looks like a great new one to get hold of - hope it comes to Oz.